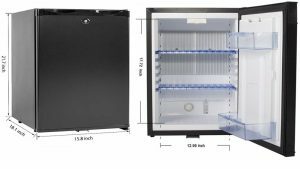 The size of this product is probably what makes it a good fit for the category of camping fridges because you need something small to be easy to handle and to fit alongside all of the other things have to be with you. However, despite its seemingly compact size, 15.8 by 18.1 by 21.7 inches, this device can fit quite a large amount of edibles inside, giving you enough room to store different items and keeping you well-fed even when you’re far away from home. The only downside to using this product at home is that you have to keep plugging and unplugging it from the respective power source that you’re currently using. To be more clear, while you’re away you can plug the fridge into a 12V power source, and while you’re near your home you can use a regular 110V outlet. Nevertheless, you can’t keep the device plugged into both these alternatives at the same time because you need to change the power cord, and that might take a bit of time and be slightly inconvenient. However, it can be avoided if you decide from the beginning on where you want to use this model. One of the most important aspects that define this alternative is the fact that it’s designed to be environmentally friendly, which means it does not consume as many resources as other items from the same category. It doesn’t use Freon gas and doesn’t produce any pollution. The low energy consumption is a good argument when you’re looking for a product to take with you on a trip because you might not have access to all the electrical power that you need to keep your devices running and having a fridge that requires less energy might be a lifesaver. This product’s size makes it a good option not only for trips in your RV or for going camping for a few days, but also for those who are looking to increase their food storage space around the house. 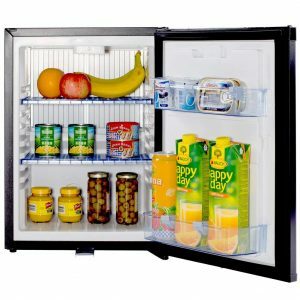 Because its small in size and doesn’t take up too much space, this fridge can be a nice addition to your kitchen devices. It’s also recommended for companies looking to furnish their rentable spaces, such as hotel rooms or holiday vehicles like boats. The compact design of this model makes it fit anywhere, and its useful functions make it a good choice every time. Many aspects make this device a relevant product in this matter, but they do not necessarily fall under a specific category. For example, it’s rear mounted and comes with a reversible door that has a balcony where you can store taller items such as juice or milk boxes that won’t fit otherwise. On the other hand, the automatic defrost function is a nice addition because it can relieve you from having to clean this fridge often. Although automatic might mean you never have to bother yourself to defrost it, some users say that’s it’s still good sense to do that once in a while.